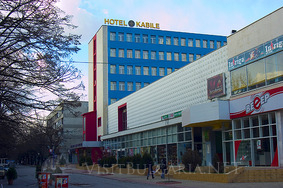 Kabie Hotel in Yambol city in Bulgaria. Book Hotel Kabile in Yambol town in Bulgaria. Book hotels and accommodation online. Location: The complex is located in the centre of the town of Yambol and has the name of the Phrygian goddess Kibele – "The great Mother of Gods" and all the living creatures, of the reviving nature and fertility. It is a city-type hotel and offers great opportunities for relaxation, business and tourism. Accommodation: For your relaxation the hotel offers 8 single rooms, 41 double rooms, 7 apartments and one VIP apartment. All the rooms are furnished with modern furniture, cable TV, mini-bar, high-speed Internet connection, phone, luxurious bathrooms and hair-driers. All the rooms, apartments and the shared premises in the hotel are equipped with air conditioners against summer heat and central heating for a comfort in the winter. Meeting Facilities:For the businessmen the hotel offers a conference hall (50 seats) with modern equipment and all the necessary things for carrying out of business meetings and events, seminars and conferences. Wine & Dine: In the exquisite atmosphere and the coziness of the luxurious restaurant “Kabile” (200 seats), you could enjoy the variety of specialties, international cuisine and a rich assortment of drinks. The complex has a second smaller restaurant called “Dionis” (50 seats) suitable for organizing of small family occasions and banquets. The lobby-bar of the complex gives the opportunity for tasting of different cocktails, drinks and high-quality coffee. Spa centre: The spa-centre of the hotel offers a large variety of procedures and massages and it is a lovely way to have a rest after a hard working day and the monotonous dullness of the big town. Nightlife: If you love the joyful nights and parties the “Boudoir” discotheque is open for you.